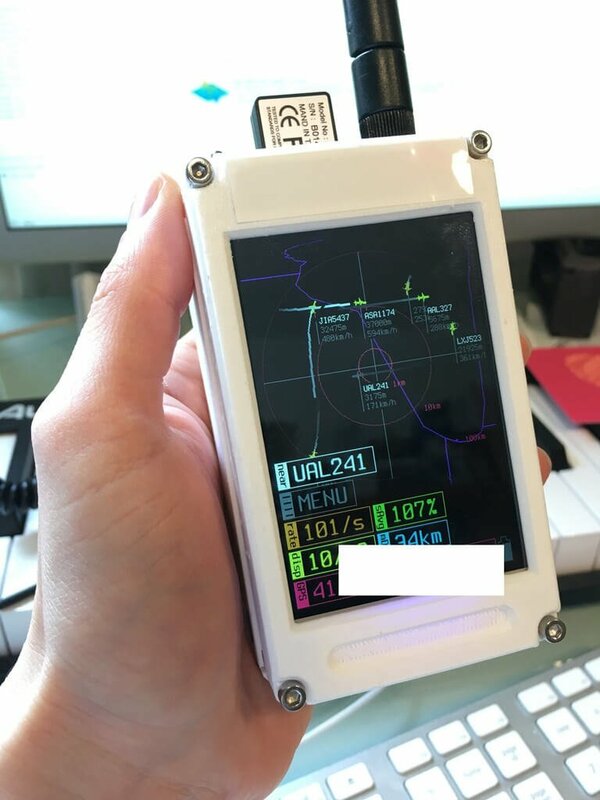 Over on Hackaday.io user nathan.matsuda has written about his RTL-SDR based hand held ADS-B aircraft receiver with display and 3D printed enclosure. His initial idea was to create a flexible and open portable SDR device, however keeping the device open and built for general use meant increased complexity which quickly slowed his progress. Instead [Nathan] decided to focus on just ADS-B for his portable device as living near an airport he’d been interested in aircraft tracking since his first SDR arrived. The device consists of a Raspberry Zero, RTL-SDR, 3.5″ IPS LCD and a battery pack for portability. For software he uses dump1090 with some custom code for the map plotting. Together with a 3D printed case and some buttons, the result is a very professional looking portable aircraft tracking device. Hopefully Nathan will continue updating his project page so that others may replicate it on their own. 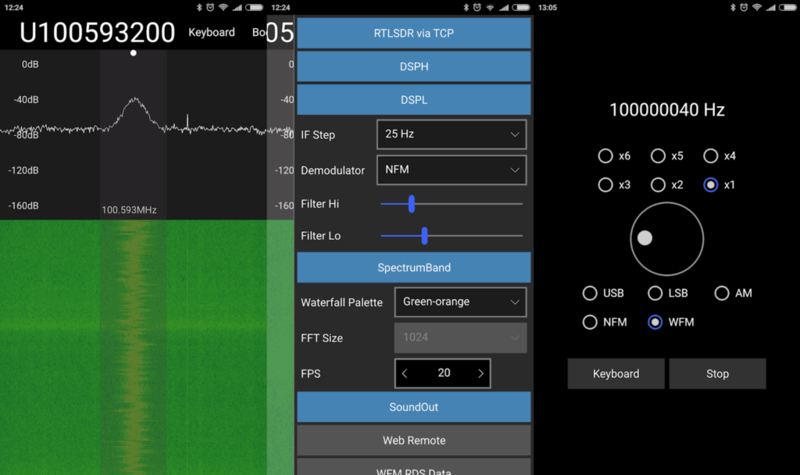 In the post a few days ago about the newly released "SDR Receiver" app for iOS, we briefly mentioned that another iOS app called "RTL_TCP SDR" has just been released out of beta and put onto the Apple store as well. An RTL-SDR Software Defined Radio receiver for iOS devices (requires an external rtl_tcp server). Listen to VHF AM and FM radio signals. View a waterfall of the RF spectrum. Connect, via the rtl_tcp network protocol, to a networked RTL-SDR USB peripheral. iOS devices do not currently support the direct connection of USB devices such as an RTL-SDR. Thus, the use of this app requires network access to a server, such as a Raspberry Pi (or Mac), with an RTL-SDR unit plugged into its USB port, and running the rtl_tcp protocol at an TCP/IP network address accessible from your iOS device. The Raspberry Pi acts, essentially, as a USB port adapter for your iOS device. No support is provided for installing any of the software needed to use this app with a Raspberry Pi. Please do not download this app unless you are already familiar with Software Defined Radio, have an RTL-SDR USB device, and have already installed and tested rtl_tcp on your Raspberry Pi, Mac, or other server. Since Apple's iOS doesn't allow an RTL-SDR to be plugged directly into a Lightning port (even with a USB adapter), an rtl_tcp adapter, such as a Raspberry Pi (or Pi Zero) server is required. This app is an experiment in real-time DSP and SDR coding using Apple's Swift and Metal GPU-shader programming languages. It includes a spectrum waterfall, and supports demodulating FM, AM, and SSB. Also, includes beta test support for the AirSpy HF+. HotPaw's "RTL_TCP SDR" running on an iPad. Hi. A first version of my iOS SDR app is nearing completion. So I'm interested finding a few users who would like to beta test a pre-release of the app, and provide some feedback. The beta test requirements are having a 64-bit iOS device (iPhone or iPad) running iOS 11.2.x or newer, having Apple's TestFlight app installed, having a Mac, PC, Raspberry Pi (or other Linux box) that already has rtl_tcp installed and ready to run. 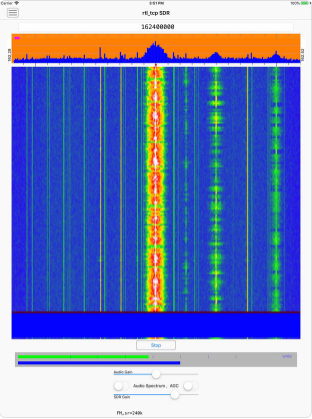 (And an RTL-SDR obviously.) The rtl_tcp server must be on a fast WiFi network reachable by your iOS device. Note that iOS TestFlight app distributions do have an expiration date. iOS does not recognize arbitrary USB devices such as an RTL-SDR. This is even true when using Apple's Lightning Camera Connection kit to provide an iPhone with a wired USB port. So an adapter must be used. I use a headless Raspberry Pi 3 running rtl_tcp as the USB adapter to provide raw IQ samples from the RTL-SDR to the iOS app. A Raspberry Pi Zero W would also work. I then connect to the server either over WiFi, or via wired ethernet. 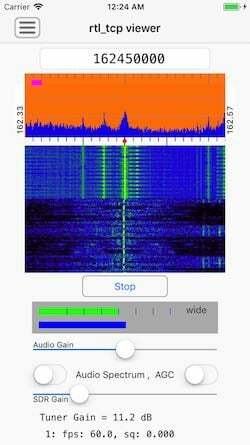 This iOS SDR app is fairly simple. I've been experimenting with developing low-level DSP code in Swift. So this SDR app was written from scratch in the Swift programming language. Because the app is targeted for the iOS App store, it uses none of the existing SDR C++ code base. The app currently demodulates AM, N-FM, and mono W-FM. It also displays a spectrum and rudimentary waterfall, and allows one to swipe-to-tune. There are not a lot of controls, as screen real-estate on an iPhone is quite limited. But I can walk around the house and, from my iPhone, monitor if my RTL-SDR or AirSpy HF+ are picking up any interesting signals. Source code to librtlsdr and rtl_tcp can be found in many repositories on github, but zero support for finding or installing such, and/or setting up your Raspberry Pi, will be provided by me.